The count, as of April 10, 2009. 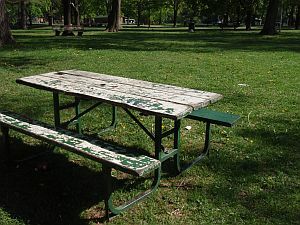 As you can see from this link http://celos.ca/wiki/wiki.php?n=StateOfGoodRepair.ParkFurniture2002To2010, the supply of picnic tables at Dufferin grove has fluctuated from a high of 45 tables to a low of 29 right now (program staff counted last week). Many of those 29 need repair, the sooner the better. 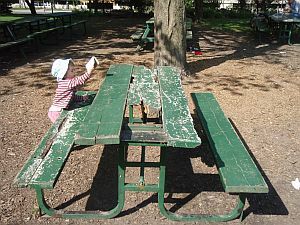 Michelle Webb has held a picnic table painting day for some years. She says she can do it again this weekend (weather permitting). Could you ask Parks to supply the paint and brushes for this weekend, as they have done in other years? 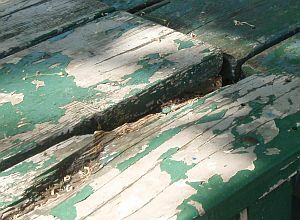 What are the plans for replacing rotting or broken slats (on both the tables and the benches)? 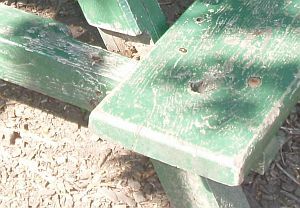 If there are no plans, could Parks pay for the wood, so that park users could join with program staff and CELOS to do the repairs? (Note that last Sunday there were over 500 people in the park in the afternoon. 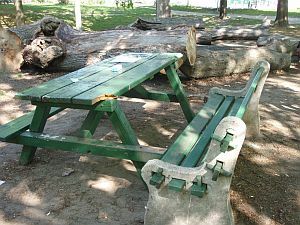 Taking the tables downtown for repair won't work if they don't come back for two months -- at least most of the broken park furniture is still available for sitting). When "State of good repair (SOGR)" funds are allocated by the Capital Projects Section, it should mean, repairing what's broken, in the most cost-effective way possible. That's not always what happens. 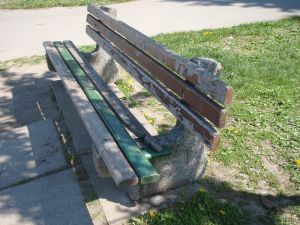 An example is the $227,400 spent on the Dufferin Grove Park wading pool renovation in 2008/2009: see the Dufferin Grove Park wading pool renovation diary.